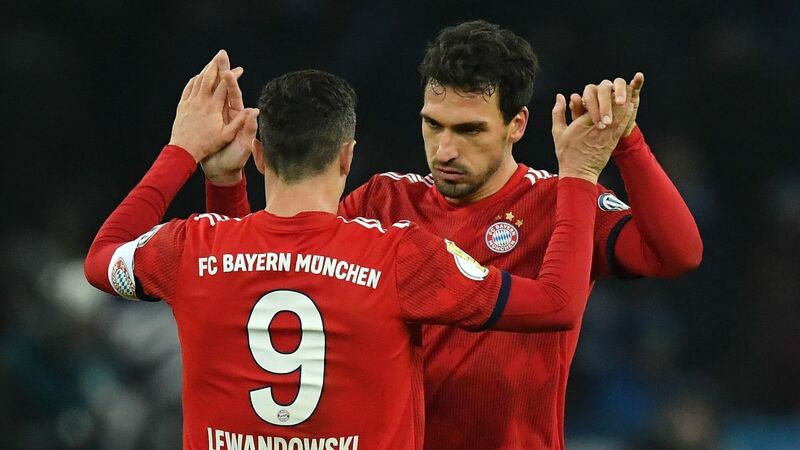 Bayern Munich booked their place in the DFB-Pokal semifinals after defeating Bayer Leverkusen 5-3 on penalties. In an even tie in which goalkeepers Bernd Leno and Manuel Neuer earned their keep in a goalless 120 minutes, it was the latter who made the decisive save from Josip Drmic to earn Bayern victory. Bayern Munich celebrate after beating Bayer Leverkusen on penalties. Thomas Muller, Robert Lewandowski, Xabi Alonso, Mario Gotze and Thiago Alcantara took their penalties to take Bayern through with their 16th successive DFB-Pokal win. Borussia Monchengladbach, meanwhile, crashed out on penalties against third-division Arminia Bielefeld. Bielefeld won the shootout 6-5 after holding the third-place Bundesliga team to a 1-1 draw over 90 minutes and then extra time. The winners reached the semifinals for the third time after 2005 and 2006, when they were still in the top tier. Gladbach's Raffael shot wide and Ibrahim Traora had the decisive penalty saved as the third-division leaders advanced. Arminia Bielefeld celebrate after defeating Gladbach on penalties. Manuel Junglas put Bielefeld ahead in the 26th minute and Max Kruse equalised from the penalty spot in the 32nd. Bielefeld had already eliminated Bundesliga sides Werder Bremen and Hertha Berlin. On Tuesday, Borussia Dortmund and Wolfsburg booked their places in the semifinals. In the semifinal, Bayern will host Dortmund, the team they beat in last year's final, while Bielefeld will be at home to Wolfsburg.